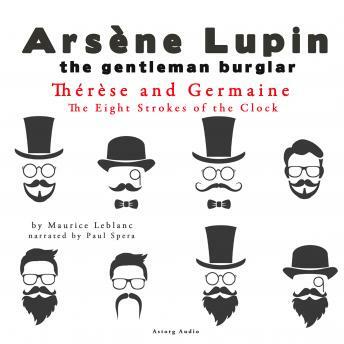 Therese and Germaine is a short story in the « The Eight Strokes of the Clock » collection of eight short stories by Maurice Leblanc. Their main character: Arsene Lupin, the beloved gentleman thief, one of the most famous characters of the detective genre. All eight stories are independent but brought together by a leading thread. Posing as Prince Renine, Lupin uses his legendary wit to free a young woman from a tedious destiny before having her make him a promise: she will become his bride if together, they manage to solve seven other mysteries before the eighth stroke of the clock, three months from then. This adventure will lead them from fearsome foes to tricky riddles, each more mysterious than the last. How was a box set on fire when nobody was in the room? How was a man stabbed in the back when nobody went into or out of his cottage after he entered it? Why are women being systematically murdered with identical hatchet blows to the forehead, several months apart? And when an insane killer threatens his beloved, the world's greatest thief will stop at nothing to catch him. Enjoy Leblanc's Eight Strokes of the Clock in top-quality narration: On the Top of the Tower, The Water Bottle, Therese and Germaine, The Lady with the Hatchet, Footprints in the Snow, At the Sign of Mercury.